Valuing and understanding the risks involved with a business or security requires the ability to benchmark individual data points against a universe. That’s why business managers, investors, and accountants alike use ratio analysis to guide their decisions. Ratio analysis provides a consistent framework for benchmarking data points from the financial statements. We can spot relationships and trends more easily by converting the raw financials into ratios. In this post, I discuss the 15 income statement focused profit and return ratios that enable investors to accurately determine a business’s profitability, competitive strength, and earnings potential. For each financial ratio discussed, I also provide a table listing the median ratio of firms in the finbox.io database by Sector. The sector medians are as of November 8th, 2017. I've also written about Credit Ratios, Valuation Ratios, and Cash Flow Ratios in past posts. 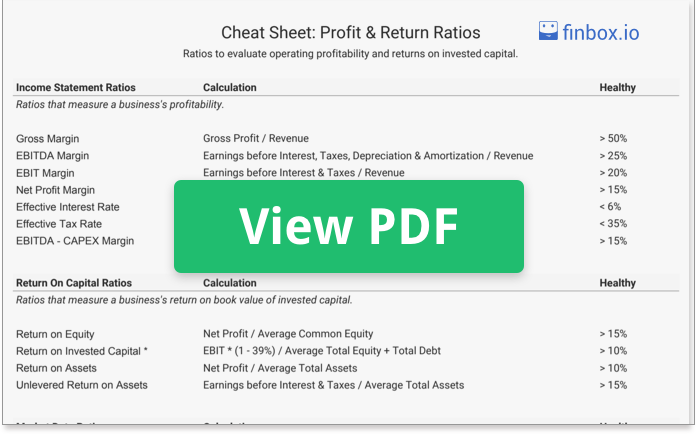 Cheat Sheet: This tab lists the Profit & Return financial ratios and formulas used to calculate each ratio. [Example] Calculator: You can use this tab calculate all the ratios discussed for any business by manually entering the financials required in designated cells colored in yellow under the "Required Data" section. [Linked] Calculator: This tab has formulas that are powered by finbox.io's Spreadsheet add-on so you can use it to automatically fetch data for supported public companies by simply changing the ticker symbol in the designated cell. Gross Margin measures the amount of gross profit a company earns on each dollar of revenue. Businesses that operate at high gross margins typically have higher pricing power over their customers and suppliers. EBITDA Margin represents the portion of revenue a business is able to convert into earnings before accounting for interest expense, taxes, depreciation, and amortization (EBITDA). EBITDA is often used as a proxy for cash flow since it excludes the non-cash depreciation and amortization expenses. EBIT Margin is similar to EBITDA margin. Instead of using EBITDA as the numerator, EBIT margin expenses depreciation and amortization (D&A) to measure the portion of revenue a business is able to convert into earnings before interest expenses and taxes. Even though D&A expenses aren't cash expenses, they do serve as a fair proxy for cash outlays such as capital expenditures and software development. When these are the material expenses for a business (usually a capital-intensive business), the EBIT margin can serve as a more appropriate measure of profitability. Net Profit Margin measures the amount of profit that common shareholders earn on each dollar of revenue earned by the firm. Businesses that operate at high net profit margins typically have more cash to invest in growth and subsequently pay dividends to investors. The effective interest rate measures the average interest rate a company pays on its debts. The effective interest rate is not the cash interest rate because its interest expense includes the non-cash amortization of discounts and premiums from the time the debt was issued. Effective Tax Rate measures the GAAP tax rate applicable to the earnings after all expenses have been deducted by the business. Note that this is the tax rate based on GAAP earnings; the cash tax rate is usually lower because firms can depreciate assets faster for tax purposes. Nevertheless, the effective tax rate serves as a good approximation of the current marginal tax rate applicable to the company. EBITDA - CAPEX Margin is similar to EBIT margin but accounts for capital costs explicitly by deducting capital expenditures. EBITDA less CapEx is often used by analysts as a proxy for unlevered cash flow. Return on Equity (ROE) is an important ratio for common shareholders. It represents the return that a firm generates on the book value of common equity. Firms with high returns on equity can finance future growth by reinvesting their earnings. Return on Invested Capital (ROIC) is used to measure a firm's ability to create value for all its stakeholders, debt, and equity. ROIC can be used to benchmark capital efficiency of firms within an industry. ROIC is also useful to when compared to the Weighted Average Cost of Capital (WACC). Since ROIC measures the company's ability to generate a return on invested capital, and the WACC measures the minimum return required by the company's capital providers (equity and debt), the difference between ROIC and WACC is referred to as Economic Profit or Excess Return. Return on Assets (ROA) measures the dollars that the net profit a business generates per dollar of assets it owns. ROA is typically used to gauge the efficiency of management at purchasing assets that generate earnings for their shareholders. Unlevered Return on Assets (UROA) is similar to Return on Assets but can be a more useful measure for benchmarking since it normalizes earnings for capital structure differences. Instead of using net profit in the numerator; the Unlevered Return on Assets ratio uses EBIT. Using earnings before interest expenses ensures that earnings (and thus returns) are not lower just because the firm utilizes debt in its capital structure. Dividend Yield measures the cash returned to shareholders by a firm as a percentage of the price they pay for each share of stock. dividend by 4 to calculate Dividend per Share. FCF Yield measures the amount of free cash flow a firm generates when compared to the market value of equity (Market Cap). EBIT Yield compares the earnings before interest and taxes to the market's valuation of the entire business, including debt and equity. The EBIT Yield was popularized by Joel Greenblatt in his book the Little Book That Beats The Market. The EBIT Yield has continued to perform well as a leading indicator as shown in recent backtests conducted by the Quantopian community. I’ve created a simple cheat sheet listing the formulas and short descriptions that you can download and print for quick reference.